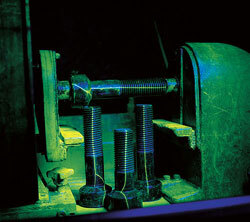 Quality Assurance – BBC Fasteners, Inc. Need a quick quote? Call us today! For three generations, BBC has been committed to manufacturing quality products for a wide range of industries. Experienced operators forge each part to customers’ specifications. It is our policy to produce products that satisfy our customers’ expectations. It is the responsibility of each employee to pursue continuous improvement in the quality and productivity of the products and services provided. All Alloy Products are sample lot inspected after heat treating for discontinuities. Our rigorous in-process inspections verified by comprehensive testing procedures assure world-class quality for our customers’ needs.